This entry was posted on Sunday, January 20th, 2013 at 3:54 pm and is filed under Uncategorized. You can follow any responses to this entry through the RSS 2.0 feed. Both comments and pings are currently closed. Here on Canada’s west coast we react to snow the same way as you do in the UK. We are wimps! And we have Anna’s here this winter too, Cedar. So cool. 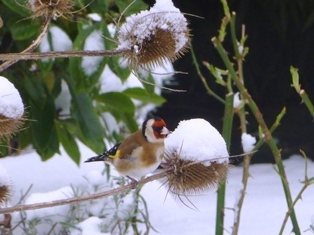 But no goldfinches sadly. It’s good to hear from you again. I hope all is well. 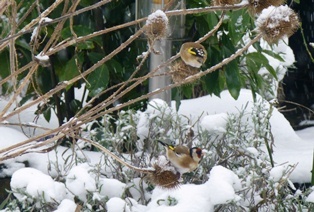 Our christmas present to each other was a bird feeder and we have enjoyed a variety of birds but the goldfinches haven’t visited yet this year despite nigra seeds especially for them. Patience! I am interested in the new natural dye extracts, Do you think that they could be used as ‘rainbow dyes’ on skeins of mordanted yarn to produce variegated skeins and self striping yarn, just as I do with acid dyes? I don’t see why the liquid extracts couldn’t be used as you suggest but some experiments would be necessary to try them out. I’m sure they could be painted on once diluted. Perhaps you could ask Debbie at DTCrafts if she has more information? There’s a link to DTCrafts on my blog.